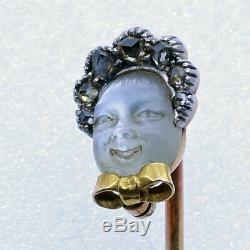 Antique Victorian cameo stickpin brooch. 14k gold, rosecut diamonds, moonstone and silver. Comes in antique fitted Tiffany & Co box. Measurements: Total length from end to end is 2 3/4 inches (7cm). Baby approximately 8.0 X 6.40mm. 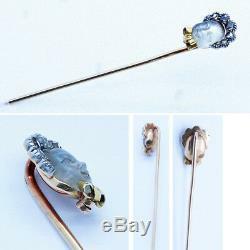 Description: Stickpin with carved moonstone and diamond baby wearing a bonnet. 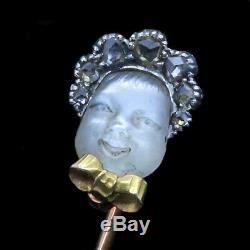 Oval moonstone with fine iridescence carved with the features of a smiling baby. She wears a bonnet, fanning out around her head in graduated rose cut diamonds. The ribbon of her bonnet is modelled of gold. Diamonds set in silver over a substantial layer of gold. During the 1880's the Victorians created a fashion of carving baby or moon faces from moonstone. Invariably beautifully set with rosecut diamonds, these are highly sought after today. This is a small, but particularly fine example. The carving is very well done and the features are quite lovely and detailed. The pin comes in a fitted box with embossed TIFFANY & CO NEW YORK PARIS LONDON on the silk inner lining. The box is made of leather with a metal clasp and hinge and is in very good condition. It is likely that Tiffany & Co was the retailer of this beautiful pin. Marks: No marks were found, but gold was tested to ensure metal purity. Condition: Good with minor wear commensurate with age. Please see enlarged pictures and don't hesitate to ask questions which we will do our best to answer. Add Me to Your Favorite Sellers. We would appreciate it if you notify us in advance, and explain the reason for the return. Please pack carefully to ensure the item reaches us in the same condition it left here and don't forget to insure and track properly. These charges are the buyers responsibility. 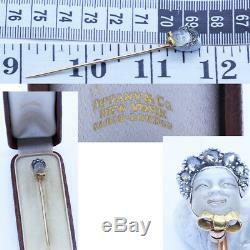 The item "Victorian Stickpin Carved Moonstone Cameo Diamonds 14k Gold Baby Face (6631)" is in sale since Friday, January 18, 2019. This item is in the category "Jewelry & Watches\Vintage & Antique Jewelry\Fine\Victorian, Edwardian 1837-1910\Pins, Brooches". The seller is "brendaginsberg" and is located in Boca Raton, Florida.